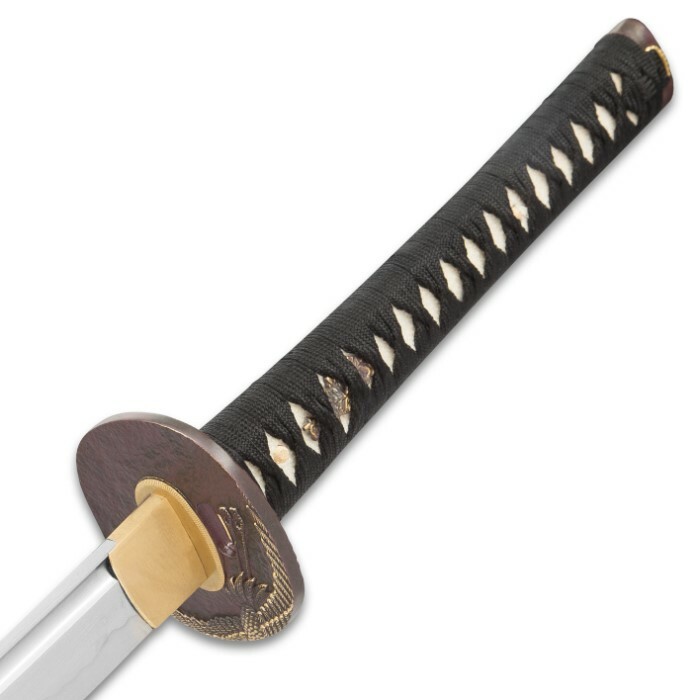 Sokojikara Soul Crane Handmade Katana / Samurai Sword - Hand Forged, Clay Tempered 1065 High Carbon Steel - Genuine Ray Skin; Bronze Tsuba - Functional, Full Tang, Battle Ready | BUDK.com - Knives & Swords At The Lowest Prices! The noble crane - so filled with otherworldly grace that kung fu practitioners imitate its delicate, fluid movements. Chinese legend says a great crane ferries the dead to the afterlife on its sweeping wings; cultures around the world believe cranes to be bringers of longevity and good luck to the living. With its resilience, sleek lines and near-mythic feel, Sokojikara's "Soul Crane" Katana is the legendary crane, personified. 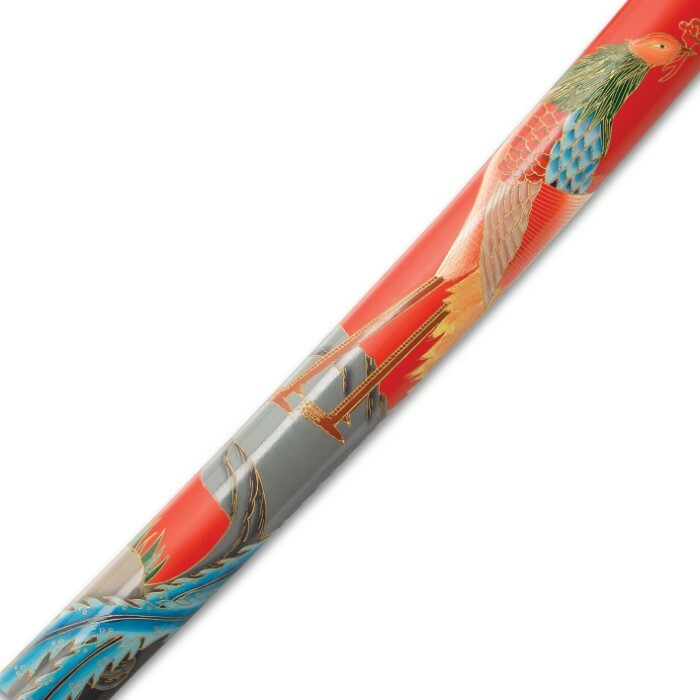 The hand lacquered saya depicts the stately bird through vibrant, radiantly hued traditional Asian art, and like a giant crane soaring on the wind, this lovingly handcrafted sword is truly a sight to behold. The Soul Crane is beautiful, eye-catching and no doubt impressive from the very first glance. But many of the sword’s greatest treasures lie beneath its striking visual facade, and some - like clay tempering - are even altogether intangible. The Soul Crane is a veritable swordcraft goldmine, never ceasing to yield rich sword-wielding experiences from the moment you first grasp the tsuka to your inaugural cut and every time you brandish it beyond. Clay tempering imparts edge retention that's simply without equal. Like a koi gliding through a still pond, the Soul Crane's blade slices through rolled bamboo tatami mats and even cinder blocks cleanly and effortlessly, suffering neither crack nor fissure and all-the-while retaining its razor sharp edge. The Soul Crane can withstand such punishing cutting trials thanks, largely, to clay tempering. 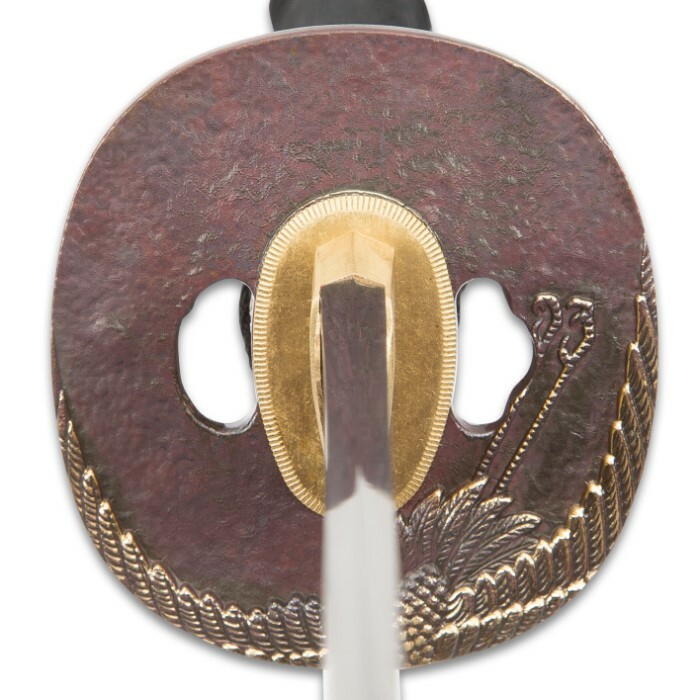 Prior to the intense heat of the hardening phase, Sokojikara's seasoned swordsmiths coat the newly formed, unrefined blade with clay - a thin layer along the edge, a thicker layer on the body and spine. When the blade emerges from the hardening forge, the clay layers' contrasting thicknesses cause the steel to cool at slightly different rates, yielding two distinct hardness regions. The less-insulated edge cools faster, making it harder for superior edge retention and shear strength. The thicker, more insulating coat of clay causes the body/spine to cool more slowly, rendering it "tougher"- less brittle, more flexible and better equipped to absorb impact energy. Though conceptually simple, clay tempering requires skilled hands and years of experience. It’s a slow, labor-intensive process that has changed little since its 15th century origins. But when you see the Soul Crane in action, you’ll undoubtedly agree it’s well worth the time and effort. The Soul Crane's weight is shrewdly distributed to maximize swinging momentum and power, blow after devastating blow. This impeccable balance also improves control and responsiveness, allowing for greater agility and flexibility in combat. The delicately textured genuine ray skin same and soft braided ito that cloak the tsuka afford a comfortable, no-slip grip, further enhancing the Soul Crane’s superb feel. Flawlessly cast from bronze like katana of ages past, the tsuba is embellished with an exquisite crane relief and bathed in a warm, antiqued patina. 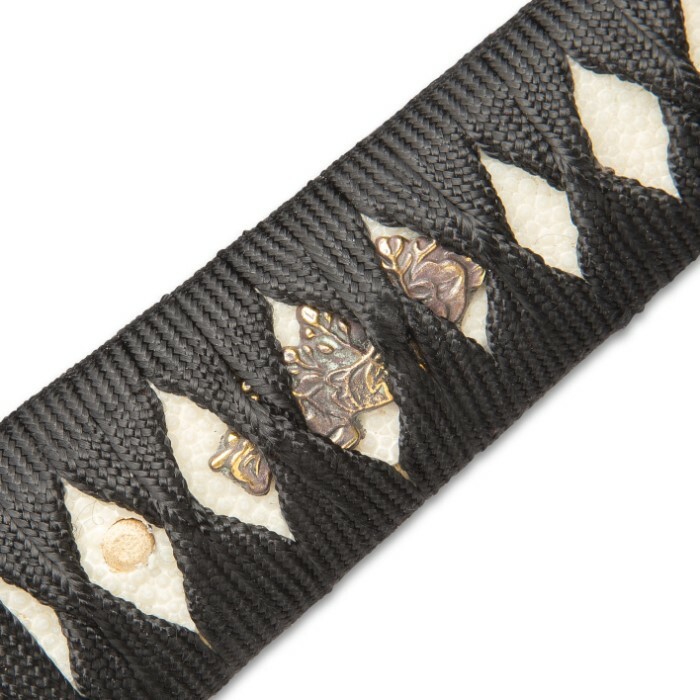 A classic menuki is nestled between ito and ray skin same, offset by traditional bamboo mekugi. Sokojikara’s Soul Crane Katana performs well beyond its price tag and holds its own against any of today's most expensive katana, outperforming many. 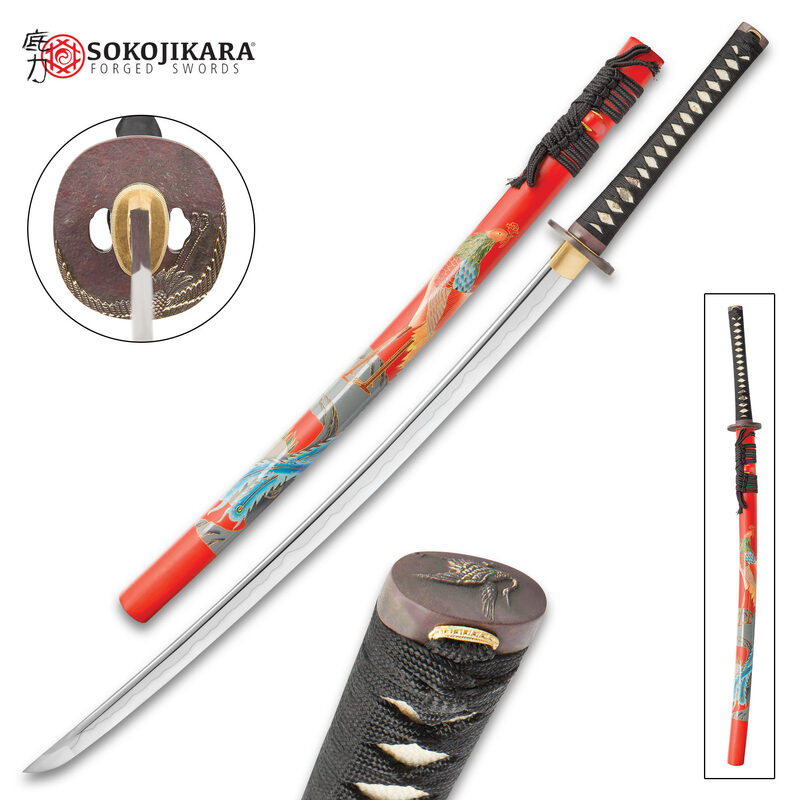 But the old cliché is true - "action" does indeed "speak louder than words," and at this unbeatable, downright unheard of price, why deny yourself the opportunity to experience Sokojikara's Soul Crane Katana for yourself? No matter how you use it, with proper care you can enjoy it for a lifetime, then pass it down to your children, grandchildren or great-grandchildren! The Soul Crane is heirloom-quality and built to be treasured by generations of your descendants - your legacy preserved in hand forged steel. As deadly as it is beautiful. The girlfriend doesn't mind that I'm going to hang it on the wall because it looks great. This is my first real sword and it's great. My only complaint is mine has no visible boshi I'm thinking because the kissaki didn't get the final polishing. There's a few teeny tiny nicks in the kissaki that I feel it wouldn't have if it had gotten that final polishing. I'm not even taking off a star for it because I still love the sword. I'm going to polish the kissaki myself which should remove those micro nicks and bring out the boshi, I feel I could see it under certain light but the lesser polish on the kissaki is noticeable to me but I'm a freak about details. Either way this thing is a razor. I trimmed my bushes with it, they just fell away. It cuts paper, in fact if you hold the paper right you can just kinda lop off pieces. I tried and failed to cut a plastic apple sauce bottle, sent it flying across the yard like I was playing T-ball. Real solid hit and the sword took it, tried a couple more times but I couldn't do it. I bet the sword in more skilled hands could though, thick plastic. I only cut half way through. The blade is good I think, you're really paying for the artwork though, it looks great. You could get more blade for the money going with Cheness, and I'll probably add some of them to the collection eventually but I wanted something unique to start it off. Didn't buy on here, tried to but they were out of stock and canceled my order on me. I loved it so much I thought I'd leave a review though. This is my second sword purchase from True swords, and I am now a customer for life! 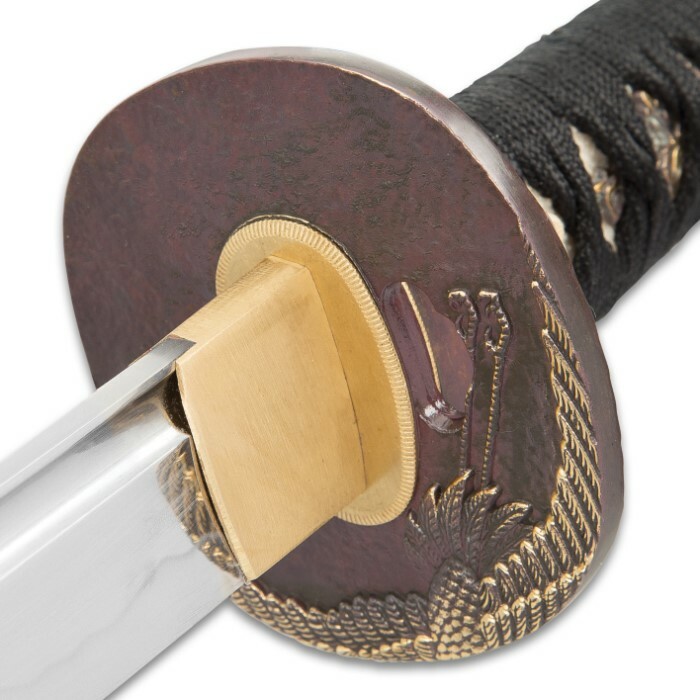 My first was the Masahiro Shadow Warrior.Both are fine weapons but the superior quality, craftsmanship and attention to detail of the Ryumon were evident right out of the box.It is easy to see why Ryumon swords are considered top of the line. After thoroughly cleaning and oiling the blade, (which is the finest I've ever seen by the way) I put the Pheonix through a few Iaido kata and found it to be well balanced and comfortable to handle.Both of my swords will be used regularly but the Ryumon is hands down my favorite. 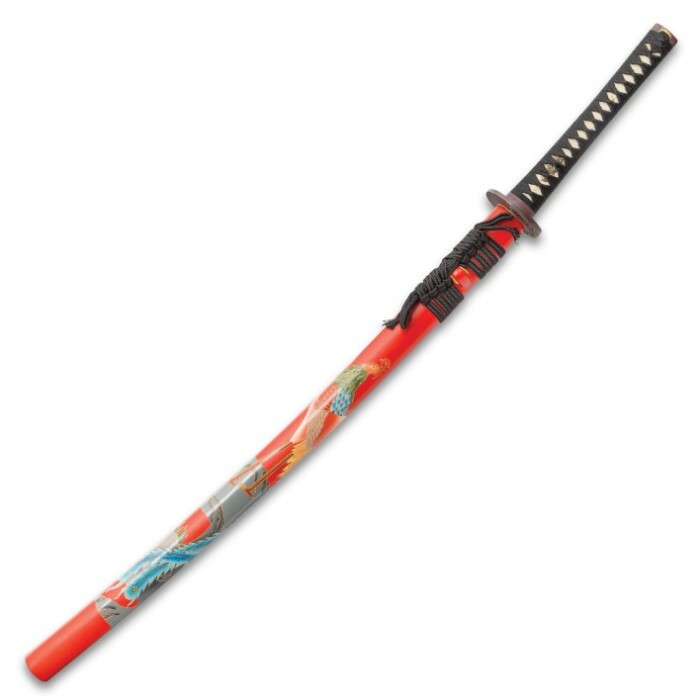 The only mistake I can see that True Swords has made with this incredible weapon is underpricing it, but that's their loss not mine. Wish I could give it six stars but there are only five. I use this sword for kata and cutting. It is beautifully balanced and cuts well, air and cutting mats alike. The Koiguchi was not cut properly and required some manual shaping, but it was very minimal and ultimately was probably made that was for a snug fit. I would definitely recommend this and it is well worth the price. Fantastic blade, great feel, and all in all real god craftsmanship, doesnt come with the wooden box though, but most sertainly worth the money. This sword is absolutely amazing very very well worth the 300 bucks for it. i tested it by throwing a wet rag in the air (the water was to make it a little heavier) and letting fall against the blade. the rag went in 2 upon contact. 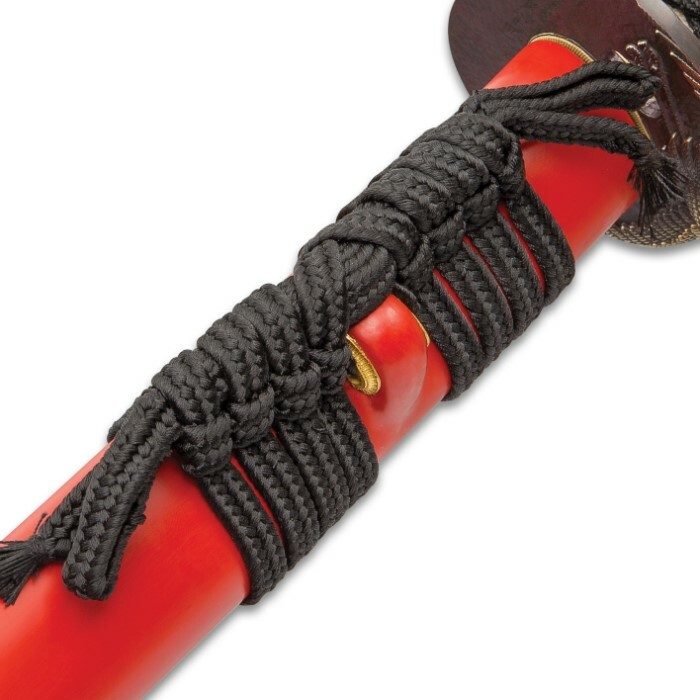 there are no problems with the sword save for one: when you first get it, the bamboo pegs holding the hilt together are very tight and hard to remove. after a while, they should loosen up. 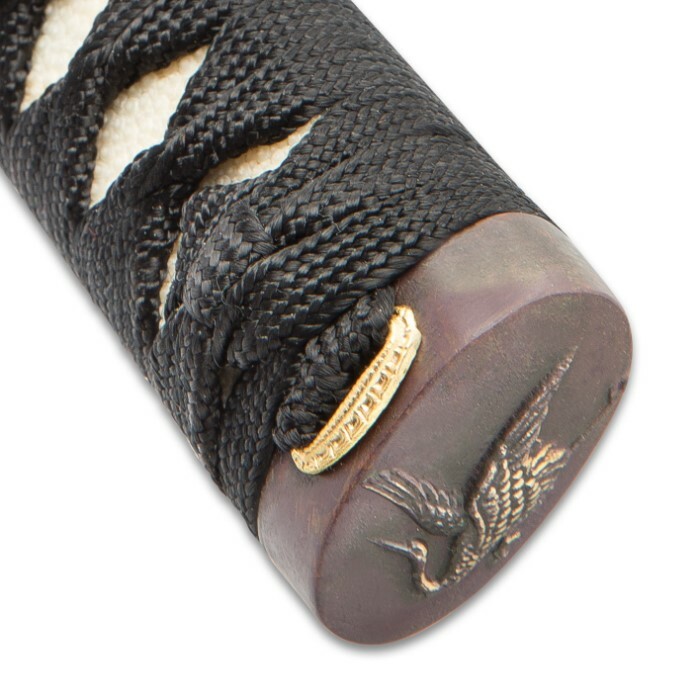 there are a couple things not mentioned in the description though: the saya shows a heron with a long blue tail that wraps around the saya, and there is a heron stamped into the pommel of the hilt, and into the fuchi just below the tsuba. it is worth the $300, and it comes sharp. mine had a smudge on the blade, but it was easily removed after i cleaned it. True Swords, your a bomb, keep it up!